The original house can be seen in the image above, taken during the construction. A very small 2-car garage was removed from the right side of the house. Before talking with us, the owners had been envisioning reclaiming the space of the existing garage for part of a new family room, but when we helped them look at what the desired end result of the project was to be, it became clear that any percieved cost savings by not tearing the garage off were far outweighed by the long-term benefits of the spatial arrangements gained by designing that junction to be just what we wanted it to be. The model image on the bottom is one option from our first schematic design meeting. This is the meeting at which we present a variety of "roads" down which we can travel to reach the final result. 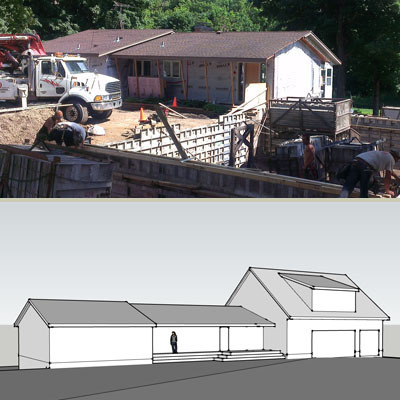 The rough model shown here gives a 3-dimensional form to what our client had originally been envisioning - the old garage is maintained and a new garage with living space above (and below, not seen from this side), was to be added on to the end of the existing structure. It became obvious that this solution would be difficult to integrate visually with the existing house, as well as having spatial challenges within.